The thing that cracks me up the most about all of this: so many articles from the celebrity sites out there have titles of “Ariana Grande’s Brother” and “Frankie Grande, Ariana Grande’s Brother.” He did Big Brother 2014 to get out of his sister’s shadow, as he stated during the season. Now he is, more than ever, in that shadow! I’m sure he loves the attention, so he doesn’t mind. Gotta get the attention of the cameras! Thanks for the updates and have a wonderful Thanksgiving! Not unusual for him at all, he acts like that all the time. sighs…and the insanity tour continues. Pink pants and a painted on shirt and bow tie. I saw him and then later read all the remarks about his appearance, none of which were favorable. He looks so stupid. Pathetic. Still with “duck” lips or mouth wide open. Nothing more to say. Hello to everyone. Same here Carol, I thought I was going to lose my lunch YUKIE!!! Hope everyone is great and looking forward to a wonderful Thanksgiving! Hi JO1! As I am Canadian, I’ve already celebrated Thanksgiving and it was wonderful. I hope you and all my BB buddies have a wonderful one as well! I’m surprised Coke didn’t put the kabosh on this stunt. Seeing as how they spend millions on PR, someone should have told them that “shirtless” is not the image they normally present. Of course they probably had no clue that he would forget half his wardrobe. 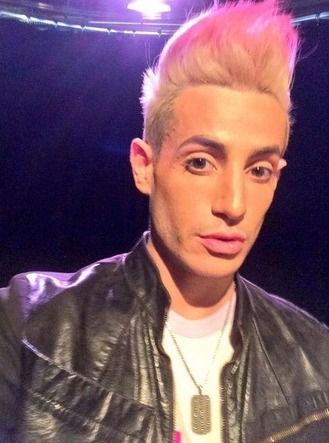 And is Frankie Grande REALLY the person you’d like to have a coke with??? On a side note: The fact that he is taking a pic with the Kardashian/Jenner clan does not do him any favors. But a fame wh*re would not know this. Hence the bottom pic of overly exaggerated lips during a photo op. Hi Cat! Sorry you didn’t get to go the audition yesterday but there’s still hope? You’ve already said it all here so far. I have to give props to the artist who painted that shirt, though. Really looks semi-real in some photos! Seriously, though, Frankie, too bad you don’t have anyone around you who loves you enough to say your duck lips should have ceased when you hit puberty! !